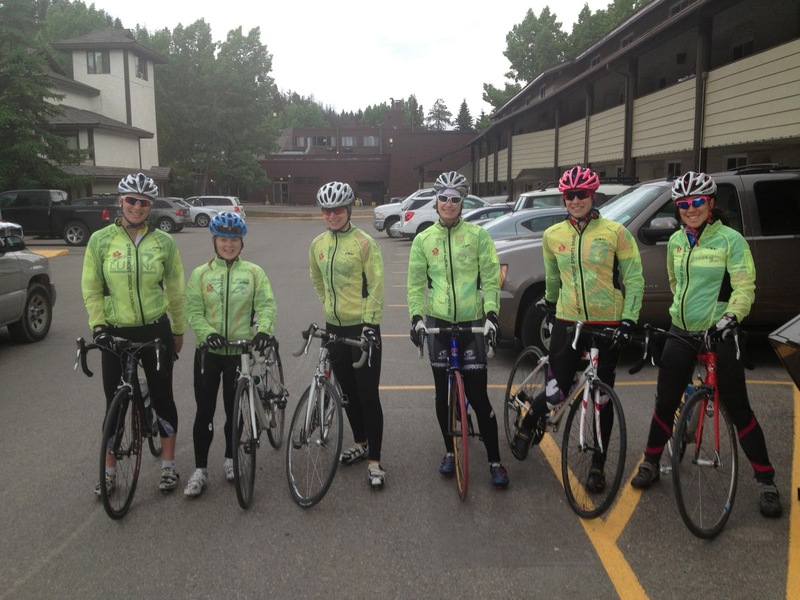 Yesterday was the last day of our great week long training camp in Jasper. If you were wondering what we got up to, well the answer is a little bit of everything. Leading up to the camp we had two solid weeks of running, biking and roller skiing in and around Canmore. Highlights from those two weeks were a long run at Minnewanka, a really fun agility, ladders and sprints workout at the Nordic Centre and the Barebones orienteering races that I raced in here in Canmore. I hadn’t done any orienteering in over a year so I was pretty worried that I would end up getting really lost. Thankfully I remembered how to use my map and compass and was able to race the womens elite course with only a few minor mistakes along the way. It was lots of fun and I hope there are more FWOC orienteering races in the Bow Valley this summer that I can join in on! If you are in the Calgary region make sure to check out the Foothills Wanderers website, http://fwoc.whyjustrun.ca/, orienteering is a great fun and challenging sport, mentally and physically. 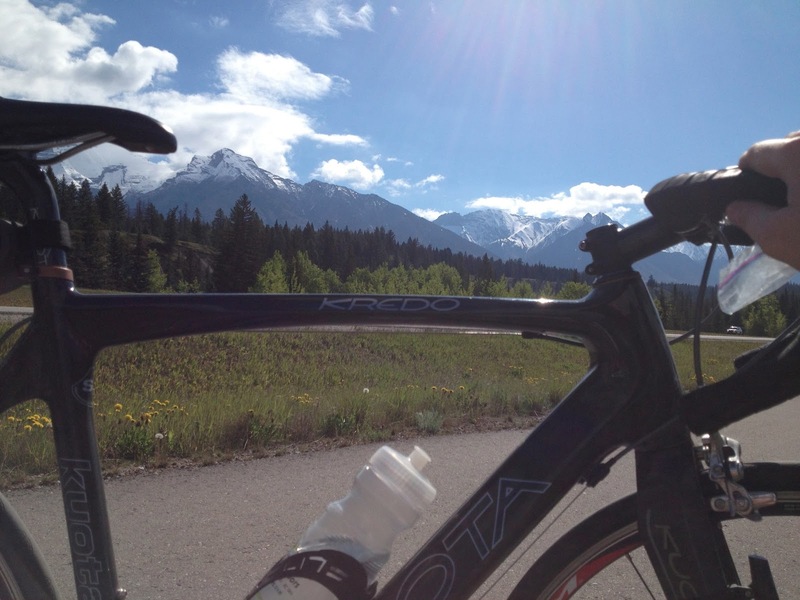 Gorgeous day with a gorgeous view on one of my rides in Canmore! As for our training camp, we ran on some great trails, finishing our sprint workout on a ridge overlooking Jasper and its beautiful surroundings. We roller skied up the road to Maligne Lake, not once but twice, skating the first time and double poling the second. 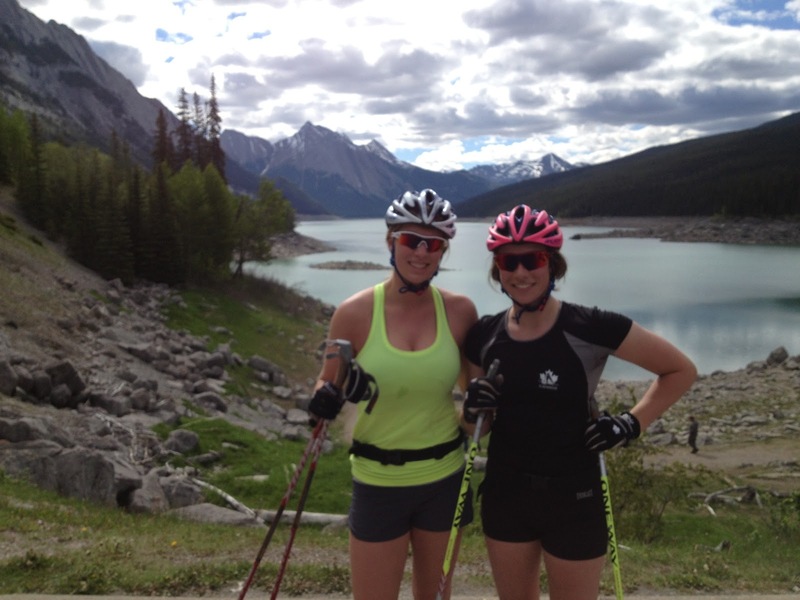 We didn’t make it the entire 40km to Maligne Lake, however we did get to roller ski alongside Medicine Lake and take in its breathtaking views as we finished our workouts. Janelle and I post double pole workout, not a bad view! And that’s not all we also went on two road bike rides. These were a nice change for the muscles and a nice increase in speed. We were able to cover more distance and saw lots of roadside wildlife. A black bear the first ride and some cute baby elk on the second ride as well as a couple deer. On Thursday we even hit up the gym. Jasper has a really nice new recreation centre with a new gym in it. This camp was my first time coming to Jasper but I can definitely say it won’t be my last. When we weren’t busy out training we had some time to explore Jasper’s quaint little main street. The weekend brought some sweet striding intervals up towards Marmot Basin followed by an afternoon recovery run (tree climbing adventure) and we finished off our camp with a great 3 hour plus run on the Saturday Night loop trail! Annika and Chris all smiles at the 2 hour mark of our 24.5k run. Thanks for the chocolate feed Chris! The Jasper training camp was the end of this training block so I now have a week of easy training to recover before we start our testing week which includes: a prologue test, a double poll test and the Canada Day run in Canmore. As for our next camp, we head up to the Haig Glacier for some on snow action July 11th! I can’t wait to ski again! 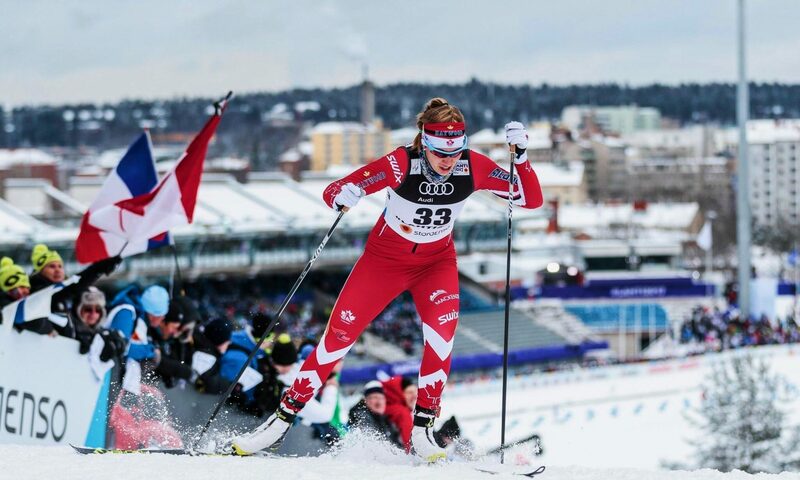 Finally I would really like to thank our coach Mike Vieira who has recently taken a job with Cross Country Canada as Manager of Coaching Development. It was amazing to have had the opportunity to work with him this past year! We did lots of technique and video work at this camp so I am confident that I have absorbed as much technique advice from Mike as I possibly can. I wish him the best of luck with his new job, he will be greatly missed by our team. Mike showing off his athleticism and enthusiasm during our team recovery run Saturday. He’s got some mad hops! 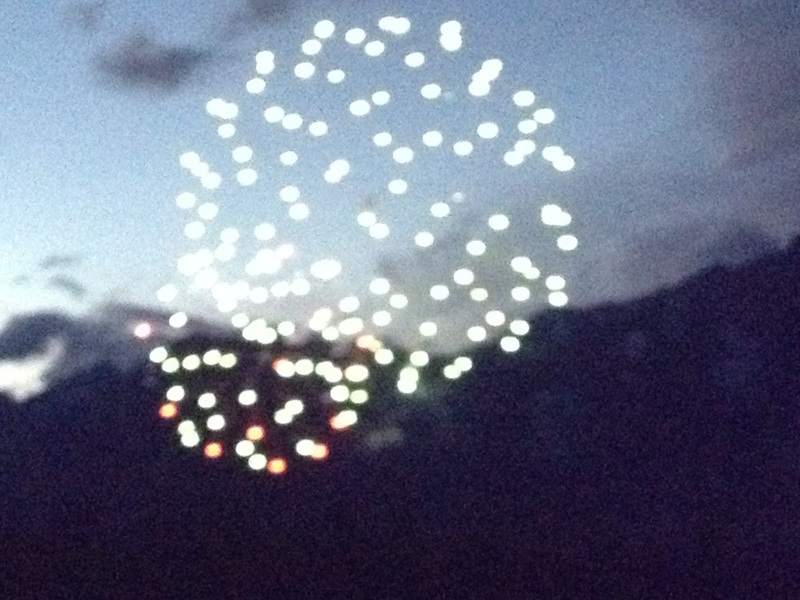 With that here is a photo from the fireworks last Canada day, I am coming up on my one year anniversary in Canmore, it’s crazy how much I’ve done in a year and how quickly the time passes. I am really excited for another year of amazing adventures. I hope everyone is enjoying the summery weather! Especially all my friends in the north, I wish I could be there for summer solstice with you all!